Pierre "Pino" Smith (left) and The Rock Pile take on Freddie Burton and All4One in the Game of the Week, and perhaps game of the year. Self Made broke a 5-game losing streak with a win over Hybrid Nation last week -- a win they desperately needed. Roster inconsistencies and conflicts between teammates have plagued this team. Both of which may have been resolved with the recent additions of Will Graham and Ron Jackson, who made their debuts last week. Graham is a speedy combo-guard who plays well in the clutch. Jackson is a 6-foot-5 stretch four who gives Self Made much-needed size without disrupting the uptempo flow the prefer to play. Things are definitely looking up for Self Made. D.O.A.’s .500 record doesn’t seem fitting, considering they have two of the most offensively dominant players in the league in Akeem Cubie and Roosevelt Scott. Like Self Made, D.O.A. has also struggled with roster issues and internal conflict. With just two games left in the regular season it might be far fetched for them to develop the team chemistry needed to make a deep playoff run, but they can never be ruled out when Cubie and Scott are on the court at the same time. D.O.A. is one win away from securing a playoff berth and Self Made could be one loss away from elimination, depending on how the rest of field fairs. It’s tough to judge this new Self Made bunch based on last week’s contest against a futile Hybrid Nation team. Still, the playoffs start tonight for Self Made. With their backs against the wall, they’ll be ready. Green Wave has been competitive in more games than not, but they just can’t seem to be able to win games. They are a slower, more precise team that averages 70.5 points a game. Hybrid Nation also plays a half court game, meaning they only play offense. They are capable of scoring triple digits, but they are just as likely to score 70. This should be an interesting contest, because these teams differ so greatly in style of play. Hybrid Nation could easily forgo playing defense in this match and open up a race to 100 points. They’d win that race every time against Green Wave. But if that doesn’t work and Green Wave is able to control a more steady half-court tempo they will likely take the match. The keys to winning are obvious, but predicting a winner based off of it is impossible. So, I’ll go with recency bias. It’s been more than two months since Hybrid Nation won a game. Green Wave won just two weeks ago and they have played in countless close games. One of two heavyweight matches on the night, this could easily be a preview of a second round playoff series. Omar’s Tires defeated Birdie’s Revenge 72-70 January 30, so BR will need to beat OT by more than 2 points to take the head-to-head tiebreaker, which may or may not come into play. Both of these teams are in a three-way tie for third place with the Scrubs, so there are definite playoff implications associated with seeding, but all three are guaranteed a top-five finish. BR has won just two of their last five and OT has lost their last two games, so neither have played their best basketball lately. This game could easily be labeled a pick em, but the slight edge has to go to the team with the best on-court leader in the league. The Scrubs rebounded with a win over the Crowd Pleasers last week after a two-game losing streak that saw losses against league giants Rock Pile and All4One. Both losses were within five points. This game could mean the difference between the No. 3 seed and the No. 5 seed for the Scrubs, but that’s about it. Win or lose, they’ll be fine. They should use this game to iron out any kinks that could limit playoff success. The Falcons have arguably had the most interesting season of any team in the league. They’ve had a near complete roster overhaul, they’ve beaten two of the league’s best teams (Birdie’s Revenge and Omar’s Tires), only to follow them up with head-scratching losses to teams that they would have been favored over (Crowd Pleasers and Savages). Last week’s loss to the Savages was the nail in the coffin for the Falcons’ playoff hopes. They could tie the Savages, Self Made and Crowd Pleasers at five wins, but they don’t hold the tiebreaker over any of those teams. With the Falcons eliminated from playoff contention, they won’t likely be playing with the intensity needed to beat an elite team like the Scrubs. This is the Game of the Week. A potential preview of the Championship Game, the regular season title and top playoff seed are at stake in this one. All4One won the first match-up 83-73 way back in Week 2 (Dec. 19), so Rock Pile would need to win this one by at least 11 points to take the head-to-head tiebreaker away from All4One. However, they would be unlikely to need that tiebreaker because they play last place Hybrid Nation in Week 14. A game in which they should win easily. If All4One wins this game, they are guaranteed the top seed. If Rock Pile wins by 11 or more, they will earn the top seed. If Rock Pile wins by 10 or less, they will need a win next week or a All4One loss to Omar's Tires to hang onto first place. Got all that? Rock Pile hasn’t lost since Jan. 9. All4One’s last loss was Jan. 16 to Omar’s Tires. Both teams are highly skilled offensively and solid defensively. Each have proven to be the most consistent and complete teams in the league, to this point. They play to their strengths and limit their weaknesses on a regular basis. That’s not to say they are that much more skilled than the rest of the league. They’ve just put the pieces together better than everyone else. Joel Armstrong of the Rock Pile is a dominant big who can also knock down threes. There is not another player like him in the league. 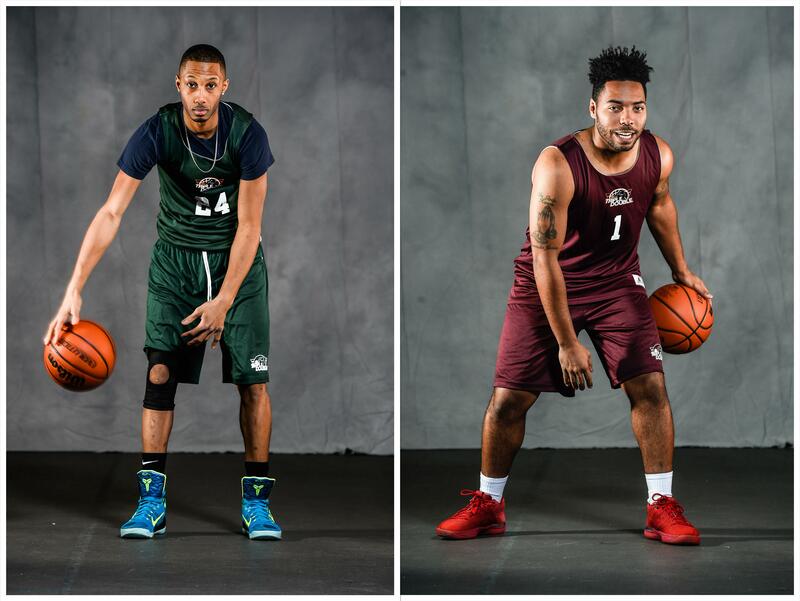 All4One’s Kevin Thompson and Marquis Walker are small forwards who play bigger than 95 percent of players in the league. They’re athleticism and length is uncanny. They score, rebound and distribute at All-Star levels. All three of these players are matchup nightmares. All4One is better in transition, but Rock Pile has the shooting edge (45% from three as a team this season vs. 39% by All4One). However, All4One could still win in a half-court, grind-it-out game even though they would prefer to compete in a more uptempo game. Because All4One is slightly more versatile, they get the advantage. With both teams sitting on the playoff bubble, this game holds the weight of a playoff. The Crowd Pleasers won the first meeting, 94-90, Feb. 6. So a five-point win would be ideal for the Savages, but a win would likely be enough to propel either team into one of the final team playoff spots. The Crowd Pleasers appeared re-energized last week with the addition of the speedy and versatile Santino Clay, however they still failed to come away with a win against the Scrubs. The Savages, meanwhile, played what was likely their best of their season in a win over the surging Falcons. It was a must-win spot for the Savages and they responded in a big way. A loss there and their season would have basically been over. These are two very evenly matched teams fighting for the same playoff spot. Gotta go with the hot hand and the team filled with Triple Double vets.